MADERA, CALIFORNIA (September 18, 2018) – The penultimate and eighth round of the coveted MAVTV-televised Late Model championships at Madera Speedway is on tap this Saturday night, with a pair of tightly contested points battles. 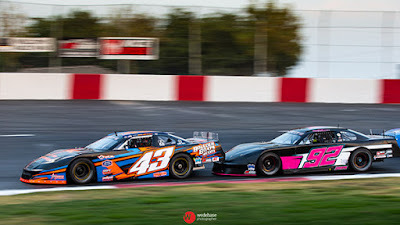 Both the RPM Mortgage Pro Late Model Series and 51FIFTY Energy Drink Jr. Late Models are enjoying some of their narrowest title fights in series history. The Mini Cups vs. Bandoleros, Modified Super Toyotas, and Toyota Sedans will also join the program on the one-third mile asphalt oval. A broken rear end was all it took to swing the RPM Pro Late Models back into Matt Erickson’s direction. The rear end broke on the #11 Pro Late Model of 16 year-old Austin Herzog of Clovis, CA in August’s round #7. Herzog did not finish the 80 lap contest, allowing 2016 champion Erickson to move 17 points ahead in the standings. Herzog is still in search of his first series win despite a run of four podium finishes in the middle of the year. A win by either Erickson or Herzog would be critical to give either driver a cushion, heading into the volatile round #9 Nut Up Short Track Shootout for $10,000 in October. Bakersfield’s Racin Vernon and Modesto’s Garland Tyler are separated by just three points in their duel for third while Ryan Hart and leading rookie Adam Lemke of Hollister are tied for fifth in the standings. Dillon Tucker of Madera Ranchos has made a nice recovery to seventh in the standings after various bouts of misfortune including a blown engine in the season opening weekend. $2,000 will go to Saturday’s winner of the 80 lap main event. The 51FIFTY Jr. Late Models for drivers ages 10-16 years old is enjoying its most exciting season yet. Four drivers have won races and all four are mathematically in the hunt for the series crown. 2017 champion Jesse Love of Menlo Park holds a slight four point advantage over Napa’s Dylan Zampa. Love is one of the hottest drivers in California coming off the heels of winning the BCRA Midgets portion of last week’s Harvest Classic at Madera Speedway. The win makes him the youngest full Midget victor in the international history of the division. Las Vegas brothers Tanner and Tyler Reif are both well within reach of the points lead and they have each won the last two events for the series. Kabe McClenny of Bakersfield anchors a close pack of competitors for fifth as well. 70 laps is on deck on Saturday night’s race. The Mini Cups vs. Bandoleros had a change at the top of the heap in August’s event when an opening lap crash impacted many of the top running Mini Cups. Napa’s Aaron Thomas capitalized for his first win of the season while points leader Kale McClenny had to settle for a DNF. He still enjoys a 47 point lead over Joseph Holliday in the points however. Bakersfield’s Riley Massey suffered a similarly bad fate in the Bandolero division as the points leader finished last but her points lead remains a strong 33 over Zachary Ginn. Kern County Raceway Park champion Kercie Jung won her third race of the year and runs third in the points. 2016 Toyota Sedan champion Jillaun Holden leads the Sedan standings while Jason Lawton won Friday’s race during the Harvest Classic. Modified Super Toyotas is led by the Reynolds brothers with Ryan Reynolds leading brother Shaun by 30 points with 2017 champion Bert Stephens only an additional eight points behind. Action gets started on Friday evening with practice from 5 p.m. – 8 p.m. Saturday’s program begins with pit gates opening at 11:00 a.m. Practices run from 1:15 – 3:00 p.m. with qualifying and heat races to follow. The first set of main events starts at 5:00 p.m. including the Mini Cup feature and the Late Model B Main. Opening ceremonies are at 6:00 p.m.